Playing Dishonored requires patience, boldness and stealth, taking risks to dig out those vital clues in order to take down a target without getting your hands dirty. Or, you can play the game as a shooter, or even as an RPG , concentrating on finding runes in order to ‘level up’ your powers. Dishonored is set in a time where The Plague is ravaging the population, turning society to ruins and seeing man turn upon man to save themselves from the outbreak, the city of Dunwall is a haven for the diseased, the dirty, and the corrupted. 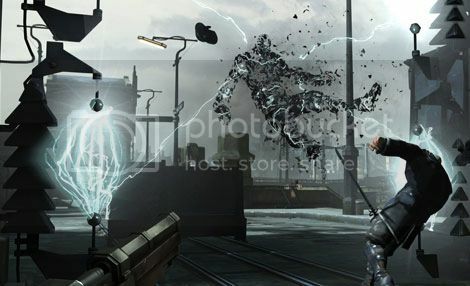 You play as Corvo, a one-time bodyguard to the Empress who is framed for her murder and the kidnap of her daughter Emily in the fast-paced opening scenes of the game. You quickly discover it’s not just the plague that’s infested this city, as the reasons behind the Empress’s murder are uncovered and a power struggle ensues as an oppressive regime rises and uses the plague as an excuse to purge citizens and claim power. You escape from prison with help from a group of activists calling themselves The Loyalists, who plan to overthrow the Government and reinstate Emily as the rightful new Empress. It’s from here that starts properly and as you are sent on numerous missions as a skilled assassin, you must deal with those that have betrayed you. The difference between good and evil is decided by how you deal with these potential targets; the choice is yours. Publisher Bethedsa Softworks are known for their open worlds (you all know Skyrim) so it comes as no surprise that developers Arkane Studios have followed in their footsteps, creating multiple ways to complete a single mission. The routes to your targets are numerous, from climbing over rooftops, to skulking through the sewers as a rat. Hiding on a window ledge to listen in on a conversation, or talking to the beaten-down citizens, can open up new paths and side quests for you to undertake. You can hack and slash your way through anyone that opposes you, or chose to sneak around and politely knock people unconscious (just remember to hide the bodies). You don’t even have to assassinate the target yourself, there is always a non-lethal approach that can be taken in order to remove your target from the scene. 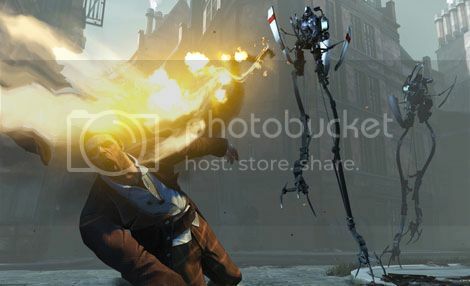 The game gives you plenty of options with other ruthless but more subtle ways to dispose of your enemies, but as the story progresses your decisions really do play a huge part in Dishonored. Every action has a reaction; the more people you kill and ‘chaos’ you bring means you’ll very quickly start to see the consequences of your choices. As well as immediate effects, it will also affect the outcome of missions, cutscenes, and finally the games ending. But you’re not forced to go down either route, even if you’re already started down one path - the entire game is scripted around your choices. Decision based gameplay is becoming common these days, but Dishonored scripts the whole world around your mercy, or lack thereof. Kill recklessly and in huge numbers, then there will be an increase in the ankle biting rats and Weepers (those affected by the plague) that populate Dunwall, whilst cleaner and more stealthy approaches will lead people to believe that accidents are the cause. It’s even possible to complete the game without killing a single soul. Helping you on your missions are a few staples of weaponry that can be dual-wielded (such as a pistol, crossbow and a sword) but you are also able to gain supernatural abilities, thanks to some ‘outside’ help. These range from being able to see through walls and short-distance teleportation, to possession (animals and humans), slowing down time, and a whole host of other powers to play with. These abilities can be bought by collecting runes that are scattered throughout the game; some can be scouted out, whilst others are received for completing side-quests. Aiding you in finding these runes is a beating, pulsing mechanical heart that also talks to you and can read the thoughts of those you are stood nearby. Controller vibrations and an increased heart-rate will alert you to any runes that are nearby. Whilst the game is set in an alternative Victorian era, it has a glorious Steampunk edge making for unique and wonderful scenes. With whale oil being the source of fuel, an array of Government mechanical weaponry is ready to stop you in your path, whilst enemy uniforms and even the mask that you wear all gives a nod to Steampunk fashion. The city of Dunwall is a fantastic world to explore, a mixture of 1800’s London and Edinburgh it may be depressing given its circumstances, but beautiful in its own way. Missions take you through palaces, brothels, distilleries, and laboratories, all ripe for exploration as the world opens up further and further. To play the game fully requires patience, boldness and stealth, taking risks to dig out those vital clues in order to take down a target without getting your hands dirty. Or, you can play the game as a shooter, or even as an RPG , concentrating on finding runes in order to ‘level up’ your powers. Dishonored provides a world in which to create your own story, and once you finish it, you’ll find yourself starting a second playthrough almost immediately as you endeavour to find out what could have happened if you had made different choices. It's for the creative gamer, who doesn’t want to follow a linear story or be forced into making choices they don’t agree with, but enjoys a story formed by their decisions and therefore a unique experience to them. Something I hope will start appearing a lot more often in future games.